Our carriage house is truly tranquil and peaceful. Watch the boats cruise around Lobster Island or the breakers hit Sally Island Ledges. Enjoy the seagulls, heron, ducks, seals and other sea life as you kayak (we include two) on beautiful Gouldsboro Bay. This new one bedroom spacious carriage house includes a large bedroom with queen bed, luxury bedding and reading library with overstuffed chair and views of the bay. Living room has satellite TV and windows overlooking the bay. New kitchen with glass top range, dishwasher, and refrigerator, fully equipped for your dining pleasure. Bathroom with ceramic tile floor and fluffy towels. You do not need to bring linens as we have provided quality linens for your pleasure. new bathroom with large soft towels, ceramic tile floor and soaps provided. We could not have picked a better place for our first visit to Maine. Experienced first hand of Maine hospitality from the gracious host. Fantastic bay view from practically all windows of this cozy cottage. Watching sunrise from the window was a real treat. "Morning Has Broken" and "Sound of Silence" immediately came to mind. 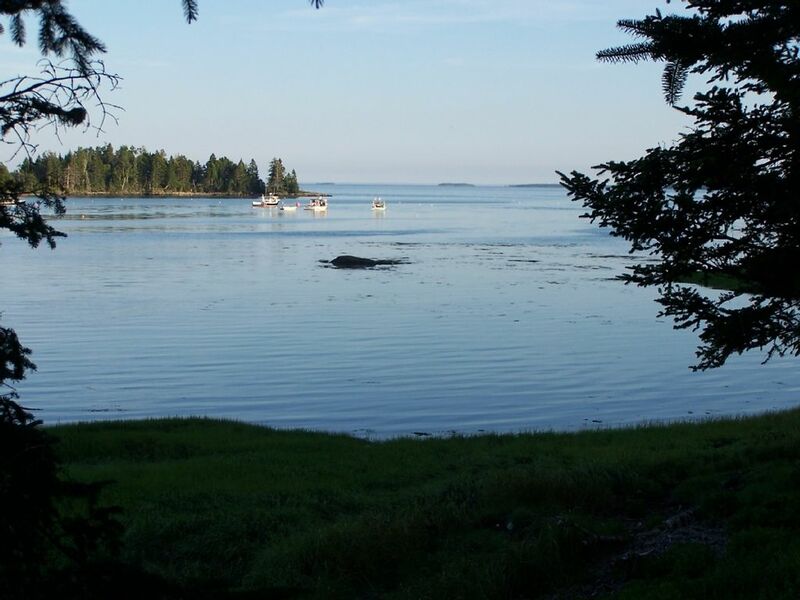 Perfect location to reach Acadia National Park, Lubec and places in between. Thank you for enjoying and caring for our special place. Please come back again soon. From the moment we pulled in the drive we knew we were in a special place! This carriage apartment felt like our home the second we walked inside. Bonnie & Mark did a good job on their design of this place. We had everything that we could possibly need for our stay. Bonnie put so much thought into every detail to make sure all of her guests were comfortable. We will definitely stay here again when returning to Maine. The location is close to Acadia National Park & Bar Harbor. Bonnie made a list and hung it on the fridge of places to visit, eat, buy pastries, etc.... we followed her recommendation and agree with her! Thank you Bonnie and Mark for making our vacation so peaceful and comfortable. You both were so nice and welcoming, we will be back to visit again. We certainly hope you come back again. We really enjoyed meeting you. You are a lovely couple. Thank you for enjoying our special place. The carriage house is perfect for a couple looking for relaxation in a beautiful setting. The cottage couldn’t be more charming. Bonnie and Mark provided great recommendations on things to do and places to see. (Mark, we are enjoying Moosehead Lake now!). We hope to return someday. This was the perfect place to stay for our anniversary. The owners are very helpful with things to do and eat around the area. Highly recommend!! Thank you. You are a sweet couple. It was a wonderful place to stay. It was so quiet and so clean. Our hosts were very accommodating and kind. They gave us the perfect place. I am very thankful for them. I would of course recommend this to anyone. Thank you for enjoying and caring for our special place. We hope you come again. Just right for us as a quiet place. We are only 15 minutes to Acadia National Park Schoodic and 35 minutes to Acadia National Park Mount Desert Island. There is hiking, kayaking, whale watching, sightseeing, bike riding, etc. in our area. We will gladly help you obtain local lobster and help you set up and cook it, if you wish. For more information on activities in Acadia National Park please visit their website.